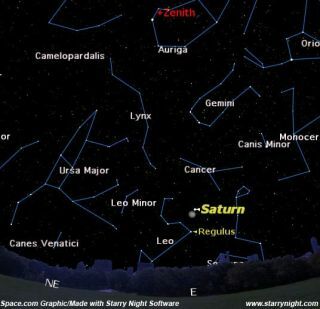 Sky Map: Saturn at 8:30 p.m. local time from mid-northern latitudes on Feb. 2, 2007. Watching the full Moon rise over the east-northeast horizon on Friday evening, Feb. 2, you will probably notice a rather bright yellowish-white "star" shining sedately just above and to the Moon's right. That object is not a star, however, but the planet Saturn. Currently, Saturn is at its best for 2007. It can be found to the west (right) of the famous "Sickle" of Leo-a backwards question mark-shaped star pattern, which contains Leo's brightest star, Regulus, at the Sickle's base [sky map]. On Feb. 10, Saturn [images] will be at opposition to the Sun, meaning it will be rising at sunset, reaches its highest point in the southern sky at midnight then drops down below the west-northwest horizon at sunrise. In other words, it's now available for viewing all night long. Saturn is the telescopic showpiece of the night sky, thanks to its great ring system in all of their icy, glimmering elegance. In small telescopes, they surprise even veteran observers with their chilling beauty even though it is expected. Certainly they will delight anyone this winter who received a telescope as a holiday gift. Any telescope magnifying more than 30-power will show them. Galileo Galilei (1564-1642) was the first to view the rings in 1610 although what he saw through his crude telescope left him completely baffled; his crude, imperfect "optick tube" revealed Saturn as having an odd pair of appendages or companion bodies on either side. He couldn't make them out clearly and thought that Saturn was a triple body, two small orbs on either side of a large one. Galileo announced this discovery in 1610 with an anagram written in Latin. The jumbled letters could be transposed to read: Altissimum planetam tergeminum observavi ("I have observed the highest planet to be triple.") Later, when the rings turned edgewise to Earth and the two companions disappeared, Galileo invoked an ancient myth when he wrote, "Has Saturn swallowed his children?" Galileo lamented that his mind was too weak to comprehend this strange phenomenon. Actually, it was his telescope that was too weak; a better telescope would have revealed Saturn's companions as rings. It wasn't until nearly a half century later that telescope lenses improved to the point where the ringlike nature of these "appendages" became apparent. On March 25, 1655, a young Dutch mathematician, Christian Huygens (1629-1695) utilized a much better telescope, and on March 25, 1655 saw the rings for what they really were. Today, we know they are composed of a myriad of small solid particles and are likely the icy fragments of a satellite that probably ventured too close to Saturn and was torn apart by tidal forces. The ancients regarded Saturn as the "highest" planet, occupying the outermost or highest sphere before that of the fixed stars. Since Saturn requires 29.5 years to orbit the Sun, its progress through the zodiacal constellations is quite slow, averaging about 2.5 years per constellation. The last time this planet was located in Leo was in 1979. In mythology, Saturn closely resembled the Greek god Cronus, but he's more usually recognized as the Roman god of agriculture. The name is related to both the noun satus (seed corn) and the verb serere (to sow). But why would the planet Saturn be linked to agriculture? Perhaps a clue can be found from the ancient Assyrians who referred to Saturn as lubadsagush, which translated, meant "oldest of the old sheep." Possibly this name was applied because Saturn seems to move so very slowly among the stars; it may have also reminded sky watchers of the slow gait of plowing oxen or cattle.